Sometimes as a result of heavy (or heavy-handed) use, brass instruments are in need of some care to be brought back to playing condition. Scott Music Services repair operation is geared to returning instruments to playable levels, and improve appearance as well. You will find our service to be competitively priced and we will strive to perform to your expectations. 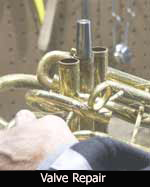 There is nothing more critical to the operation of a brass instrument than the valves, trombone hand slide, and tuning slides. Valves and hand slides need to operate smoothly and without effort. Additionally, valves need to be properly aligned so that the instrument will respond easily and clearly. 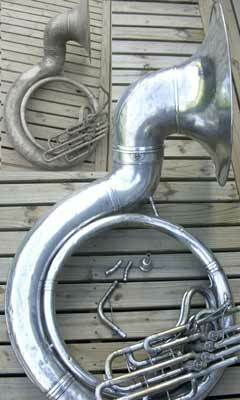 Draggy Slides: Trombone slides are sensitive to even minor damage. Because of the long unsupported length of the slide tubing, absence of dents, parallel inner and outer tubes, roundness of the tubing and overall straightness of the over all length of tubing are all critical to a properly function slide. Sticking/Poorly Operating Valves: There are a number of causes for poorly operating valves, from simply being incorrectly aligned, to damaged valve casings, out of round pistons, bent valve stems, etc. Correctly adjusted casings, pistons, rotors, stems, and proper sized corks felts, bumpers, and springs are all necessary for valves to have comfortable action and smooth resistance free operation. Stuck Tuning Slides: Tuning slides frequently become stuck and at times are so severely stuck that it is necessary to dissemble the slide to remove the tubing from the instrument. Additionally, they need to be parallel and smooth working to be useful. Lapping the slides can sometimes improve the ease in which they move. 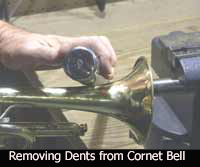 Some of the most obvious need for many brass instruments is the removal of dents. Sometimes dents are just a cosmetic flaw that doesn´t seriously compromise the playability of the instrument. Nevertheless, when they are easy to reach, removal of these dents make the horns more acceptable to players at little cost. Other times, dents do compromise the performance of the instrument and their removal is necessary for the usefulness of the instrument. Local composer, George Rosenkrans of Penfield PA, was a prolific writer of concert band music, particular marches in the military band style.